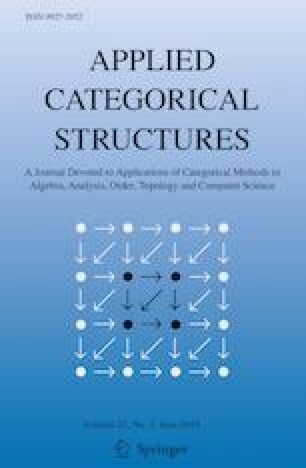 A categorical framework for modeling and analyzing systems in a broad sense is proposed. These systems should be thought of as ‘machines’ with inputs and outputs, carrying some sort of signal that occurs through some notion of time. Special cases include continuous and discrete dynamical systems (e.g. Moore machines). Additionally, morphisms between the different types of systems allow their translation in a common framework. A central goal is to understand the systems that result from arbitrary interconnection of component subsystems, possibly of different types, as well as establish conditions that ensure totality and determinism compositionally. The fundamental categorical tools used here include lax monoidal functors, which provide a language of compositionality, as well as sheaf theory, which flexibly captures the crucial notion of time. Schultz, Spivak and Vasilakopoulou were supported by AFOSR Grant FA9550–14–1–0031 and NASA Grant NNH13ZEA001N. We greatly appreciate our collaboration with Alberto Speranzon and Srivatsan Varadarajan, who have helped us to understand how the ideas presented here can be applied in practice (specifically for modeling the National Airspace System) and who provided motivating examples with which to test and often augment the theory. We also thank the anonymous reviewers for valuable suggestions; in particular, such a suggestion led to a more abstract formalism of system algebras, explained in Section 2.4.